My daughter loves those flavored coffee creamers. You know the ones. Full of goodness like Partially Hydrogenated Soybean and/or Cottonseed Oil or Sodium Stearoyl Lactylate. Um.. yum? I wanted to come up with an alternative that didn't make me feel like I might be poisoning her morning cup of coffee. I wanted no corn syrup, natural flavoring and low fat. This "recipe" or method is highly adaptable. So I talked to her, and we decided to try a chocolate creamer. Evaporated milk is milk with 60% of the liquid removed. Sweetened condensed milk is similar, it's milk that's had a lot of the water removed, and in the case of Eagle Brand, it's sweetened with sugar. 1/4 cup of instant non-fat dry milk. Blend for a minute to get everything mixed and pour into a jar. Both my eldest and E tried it in their next cups of coffee and both loved it. Since it's a very thick milk, it whitens the coffee nicely. The fat came from the condensed milk, but it's pretty low-fat and you can buy low fat condensed milks that have even less fat. I used brown sugar because it's what my daughter prefers in her coffee, you can omit the sugar completely if it's sweet enough with just sugar in the condensed milk. 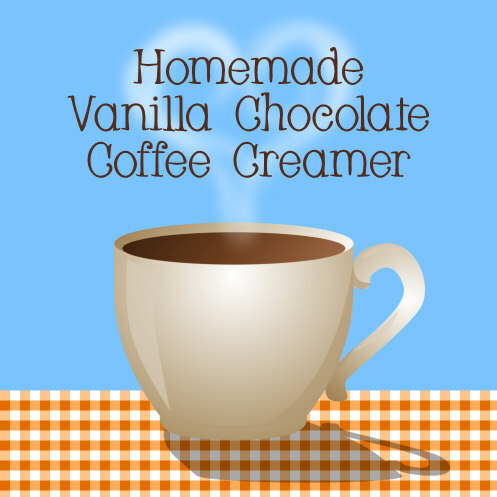 If you use evaporated milk and the non-sugar sweetener of your choice you can make a coffee creamer that's sugar-free. If you want fancier flavors, you can use extracts or candy flavors. Works fine in hot or cold coffee. Probably not an issue for most people, but the only time my family drinks hot coffee is if it's just finished brewing. Mostly we all prefer it cold. Today we are roasting chestnuts! Yum yum! Other than that, I'm working on a pendant, and still working on a scarf for my son for the holidays.